I got a good laugh out of that sentence. Wow, someone really thinks that? 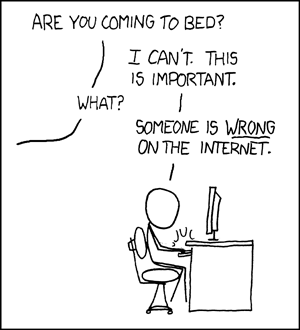 But then the comment began to haunt me. I kept thinking about it and kept returning to the article to see if anyone had tried to explain to brucel33 how H1N1 came to be. And every time I went back and re-read the comment, the more overwhelmed I became. The task of explaining was just too enormous. Sure, someone could write an H1N1 explainer in the comments. But where does that get you? It’s already been explained a million times on the internet, in books, in magazines, television, YouTube, even comic books. How viruses combine, evolve, and jump between species is not a mystery. 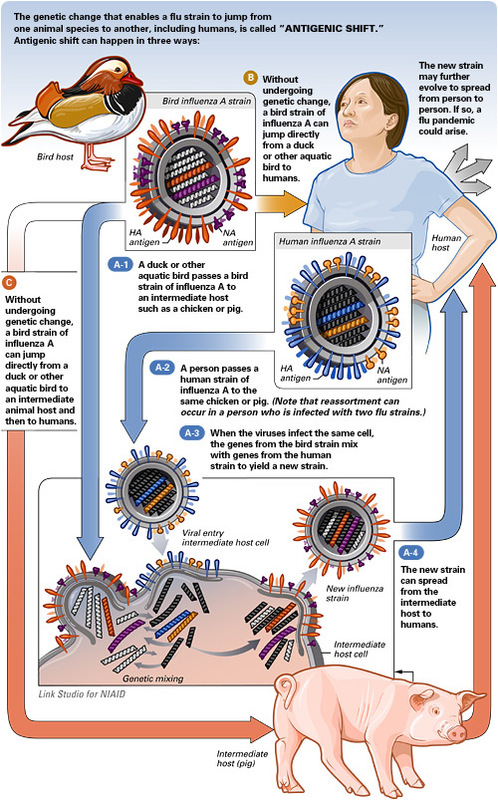 No pigs mated with ducks in the making of this virus. National Institute of Allergy and Infectious Diseases (NIAID). Illustrator: Links Studio. Yet there are still people like brucel33 out there who somehow have missed all of that freely available education – or simply refuse to look at it. I understand treating some subjects like a black box. I don’t really understand the details of how wireless information travels through the air and gets to where it’s going (sorry dad) and I’m not all that inclined to go figure it out. So why do I care if the brucel33s of the world don’t understand the fundamentals of viruses or how vaccines work? I care because these people do not just sit quietly. Lacking any fundamental knowledge of biology, they just make up something (usually involving conspiracy) and then loudly spread it, like a virus. And that virus catches in the ears and minds of others who are equally misinformed and before long it develops into a pandemic. And I care about that, because feverish ranting of the infected sometimes crowds out the real science and before you know it, policy-makers and politicians (who are not always the most science-savvy species) are infected then you end up with situations like North Carolina rejecting scientific predictions of sea-level rise, making up their own numbers, and passing legislation that puts coastal communities at risk. H1N1 is swine flu is MAN MADE VIRIUS, ON RECORD, PERIOD. It consist of 3 different strains of flu found in a Human, Pig and a Bird. Tthe different flus can not join together in nature, EVER. The chance of a humans flu, a pigs flu and a bird flu SOME HOW finding each other and joining each other to make one virus is ZERO !! !, It can not happen.